I recently got a question from a reader about combining multiple worksheets in the same workbook into one single worksheet. I asked him to use Power Query to combine different sheets, but then I realized that for someone new to Power Query, doing this can be tough. So I decided to write this tutorial and show the exact steps to combine multiple sheets into one single table using Power Query. 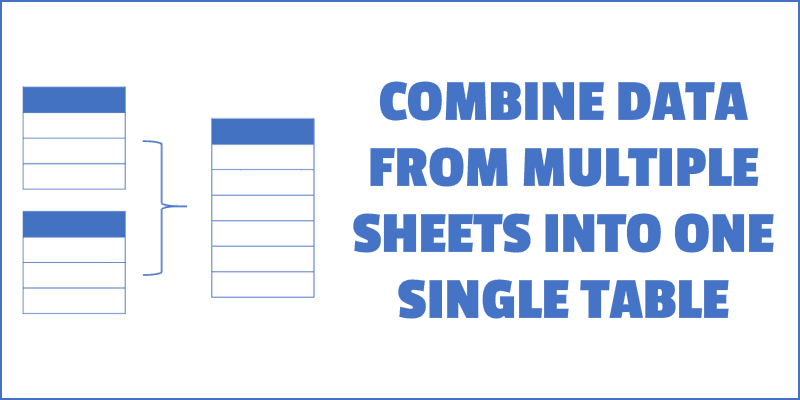 Below are written instructions on how to combine multiple sheets (in case you prefer written text over video). When combining data from different sheets using Power Query, it’s required to have the data in an Excel Table (or at least in named ranges). 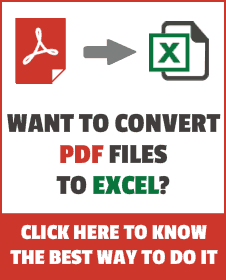 If the data is not in an Excel Table, the method shown here would not work. Suppose you have four different sheets – East, West, North, and South. Each of these worksheets has the data in an Excel Table, and the structure of the table is consistent (i.e., the headers are same). Click here to download the data and follow along. This kind of data is extremely easy to combine using Power Query (which works really well with data in Excel Table). For this technique to work best, it’s better to have names for your Excel Tables (work without it too, but it’s easier to use when the tables are named). I have given the tables the following names: East_Data, West_Data, North_Data, and South_Data. In the Get & Transform Data group, click on the ‘Get Data’ option. Go the ‘From Other Sources’ option. Click the ‘Blank Query’ option. 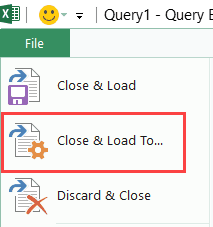 This will open the Power Query editor. In the Query editor, type the following formula in the formula bar: =Excel.CurrentWorkbook(). Note that the Power Query formulas are case sensitive, so you need to use the exact formula as mentioned (else you will get an error). Hit the Enter key. This will show you all the table names in the entire workbook (it will also show you the named ranges and/or connections in case it exists in the workbook). [Optional Step] In this example, I want to combine all the tables. 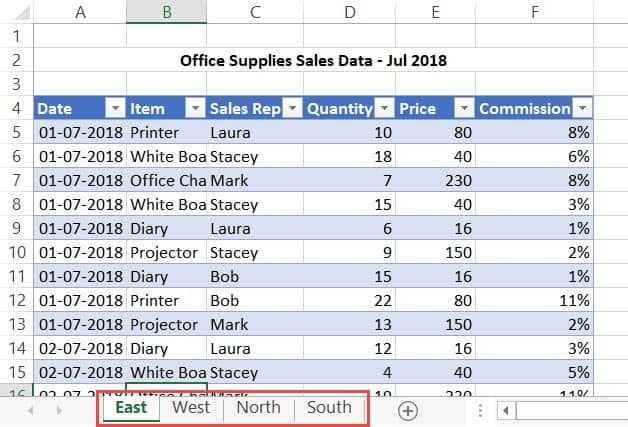 If you want to combine specific Excel Tables only, then you can click the drop-down icon in the name header and select the ones you want to combine. Similarly, if you have named ranges or connections, and you only want to combine tables, you can remove those named ranges as well. In the Content header cell, click on the double pointed arrow. Select the columns that you want to combine. If you want to combine all columns, make sure (Select All Columns) is checked. Uncheck the ‘Use original column name as prefix’ option. The above steps would combine the data from all the worksheets into one single table. If you look closely, you’ll find the last column (rightmost) has the name of the Excel tables (East_Data, West_Data, North_Data, and South_Data). This is an identifier that tells us which record came from which Excel Table. This is also the reason I said it’s better to have descriptive names for the Excel tables. Drag and place the Name column to the beginning. Remove the “_Data” from the name column (so you’re left with East, West, North, and South in the name column). To do this, right-click on the Name header and click on Replace Values. In the Replace Values dialog box, replace _Data with a blank. Change the Data column to show only dates (and not the time). To do this, click the Date column header, go to the ‘Transform’ tab and change the Data type to Date. Rename the Query to ConsolidatedData. 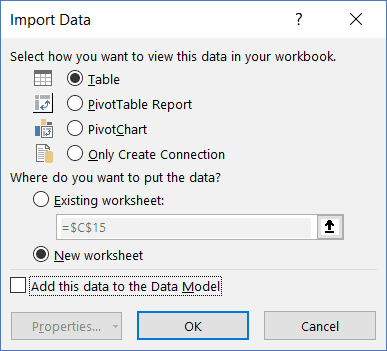 Now that you have the combined data from all the worksheets in Power Query, you can load it in Excel – as a new table in a new worksheet. Click on Close and Load To. The above steps would combine data from all the worksheets and give you that combined data in a new worksheet. In case you have used the above method to combine all the tables in the workbook, you’re likely to face an issue. See the number of rows of the combined data – 1304 (which is right). Now, if I refresh the query, the number of rows changes to 2607. Refresh again and it will change to 3910. Every time you refresh the query, it adds all the records in the original data to the combined data. 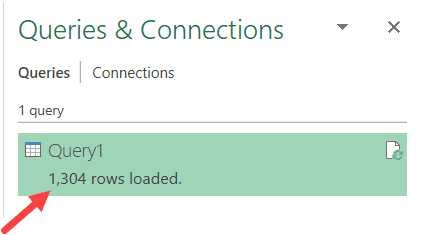 Note: You’ll face this issue only if you have used Power Query to combine ALL THE EXCEL TABLES in the workbook. In case you selected specific tables to be combined, you’ll not face this issue. Let’s understand the cause of this problem and how to correct this. When you refresh a query, it goes back and follows all the steps that we took to combine the data. In the step where we used the formula =Excel.CurrentWorkbook(), it gave us a list of all the tables. This worked fine the first time as there were only four tables. 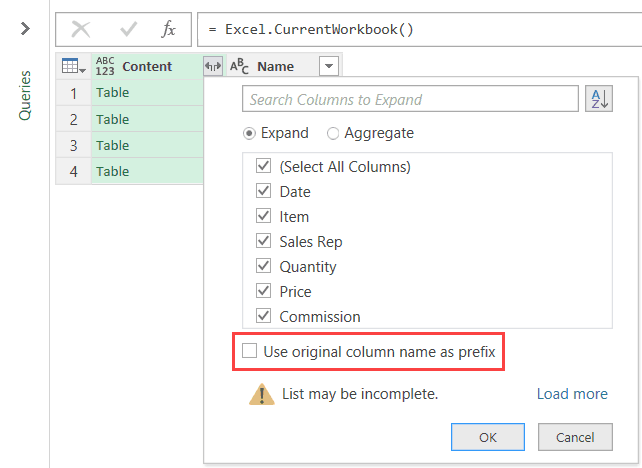 But when you refresh, there are five tables in the workbook – including the new table that Power Query inserted where we have the combined data. 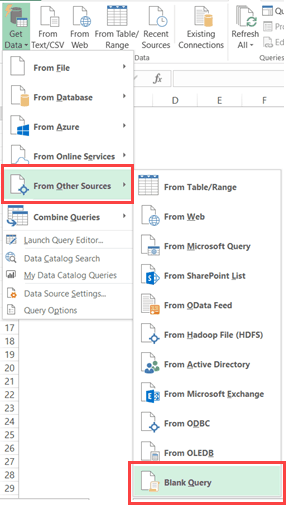 So every time you refresh the query, apart from the four Excel Tables that we want to combine, it also adds the existing query table to the resulting data. Here is how to solve this issue. Once you insert =Excel.CurrentWorkbook() in the Power Query formula bar and hit enter, you get a list of Excel Tables. To make sure you only get to combine the tables from the worksheet, you need to somehow filter only these tables that you want to combine and remove everything else. Click the drop-down and hover the cursor on Text Filters. Click on the Contains option. In the Filter Rows dialog box, enter _Data in the field next to the ‘contains’ option. You may not see any change in the data, but doing this will prevent the resulting table from being added over again when the query is refreshed. Note that in the above steps we have used “_Data” to filter as we named out tables that way. But what if your tables are not named consistently. What if all the table names are random and have nothing in common. 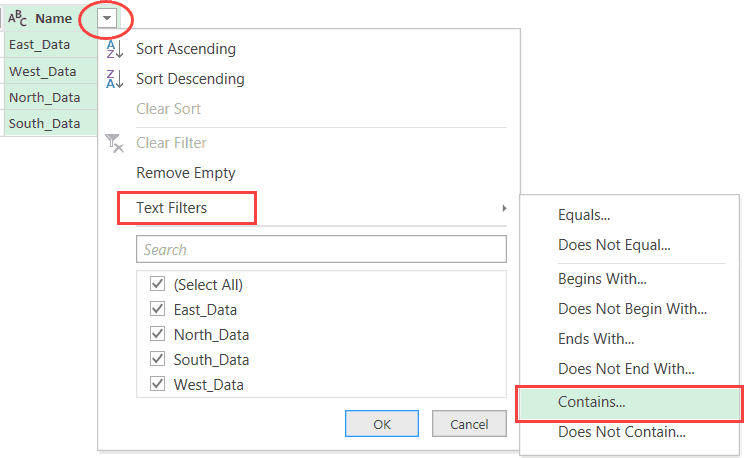 Here is the way to solve this – use the ‘does not equal’ filter and enter the name of the Query (which would be ConsolidatedData in our example). This will ensure that everything remains the same and the resulting query table which is created is filtered out. Apart from the fact that Power Query makes this entire process of combining data from different sheets (or even the same sheet) quite easy, another benefit of using it that it makes it dynamic. If you add more records to any of the tables and refresh the Power Query, it will automatically give you the combined data. Important Note: In the example used in this tutorial, the headers were same. 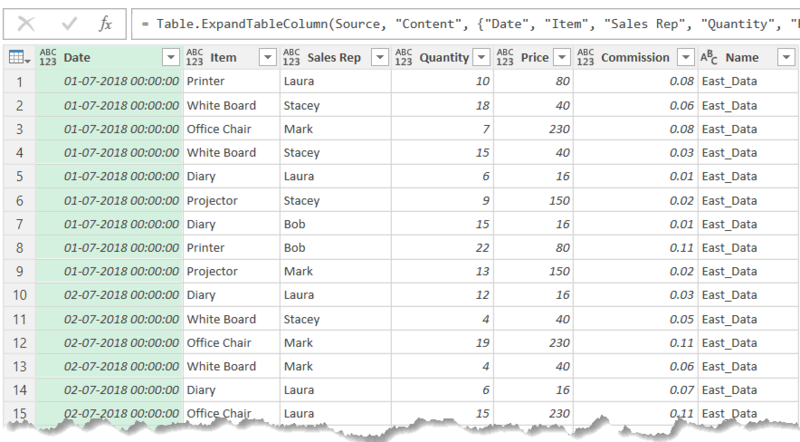 In case the headers are different, Power Query will combine and create all the columns in the new table. If the data is available for that column, it will be shown, else it will show null. This was fantastic. It was exactly what I needed and worked just as described. I have a different version of excel but it was easy enough adjust. This is going to be a huge time saver for me! Just what I needed – very easy to follow and worked like a dream – thanks! This was extremely helpful and I did a test on my computer – worked wonderfully. I work for a company that uses google drive – is there a way to do this with google sheets? Wow – great stuff. 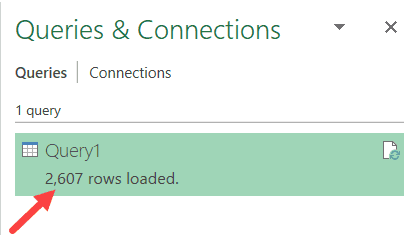 Have excel 2010 and had to download the query add-on but it works. However – it was a bit cumbersome trying to figure out how to actually do this. With the add-on, it will not show the “current workbook” at least it didn’t on my couple tries. So instead of loading a “blank query,” I started with “start query from file” and then selected the file I wanted.” In the “NAVIGATOR” I selected the whole folder (i.e. workbook) not an individual sheet. From there, I had to go to “EDIT QUERY.” Then, I had to figure out how to delete the columns in the query in order to get the same two columns (“CONTENT” (table) and “Name” (sheet name).” From there, I right clicked on the “double arrow” as explained above. It preloaded all the columns and I hit “OK.” Now I was able to simply “RENAME” each column with the headers I needed from each of the sheets. Then I clicked “Close and Load” and done. This method worked fine, until I was going to load it to a new sheet, then Excel crashes. Can I get around this, I wonder? Hi, it took me a while but I finally got through, although not as neat as you. For some reason my column names changed to Data.Column1, Data.Column2 etc. while my regular headers became text and are mixed in in my data now. When I change the names from DataColumn1 etc to the original names and save it, they will reverse back to DataColumn1,2,3…etc. as soon as I refresh. Any ideas? You can rename each name for the “DataColumn1” etc. by editing the query and right-clicking the column name. Look toward the bottom of the pop-up context menu. Click on “Rename” with the header names you like and voila – it’s done. Then, once you close and load the sheet, you can simply erase rows 1-2 which are likely the rows you didn’t want/need. Hope that helps. This is great – THANKS !!!!! !